This last summer I went to Colorado for my grandson’s first birthday. On a summery Saturday morning my beautiful daughter-in law and I walked to the local Farmer’s Market. We picked up a lug of peaches to turn into jam, along with a few other items. One of the things we could not resist was the little mini-donut stand. I mean they were making them hot right there and had a few toppings to choose from. It was a no-brainer. We picked the bacon maple donuts that had actual crisp bacon bits and maple glaze drizzled over them. We also got a dozen cinnamon sugar sprinkled donuts. Ohh my gosh! It had been so long since I had tried a donut that I seriously forgot how addicting they are! But the time the three of us walked home we had eaten several of them. I do want to make it clear that they wee about the size of a donut hole but still, they were amazing. I think the biggest reason I don’t do a lot of donuts is that they are fried. Which can be a problem if you are trying to count calories. 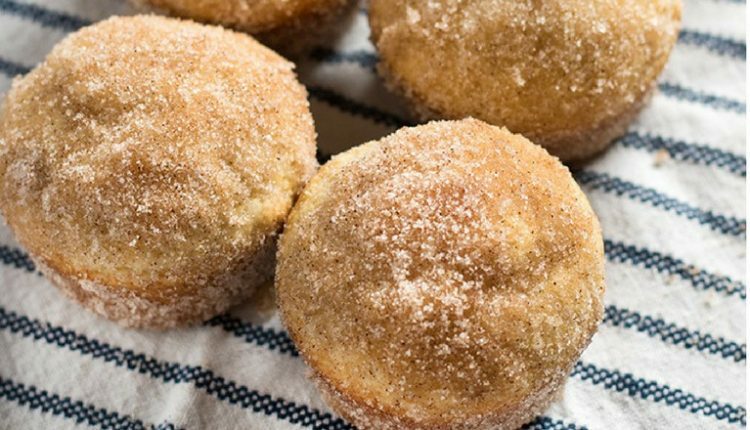 This muffin recipe is combining the fluffiness of a donut with the batter of a muffin and the results will have everyone at work wondering where you bought these from. This is what Nichole has to say about her recipe. Quick Tip: go ahead and make a maple glaze and sprinkle with bacon bits before glaze dries. All I am sayin’ is those were good treats! Recipe and image courtesy of Nichole at the Salty Marshmallow.